A cigarette lighter in your car is now a universal tool: you can plug various types of devices in it, including a portable 12 volt coffee maker. There are two types of car coffee makers: portable drip (filter) device, car espresso machine. heated up to 87-95°С (below the boiling point), the water naturally seeps through ground coffee and flows out. Because a portable electric device features heating elements that have limited capacity, water passes through ground beans a bit slower. This is a case when a weak point turns out to be a strong one. The lower the thermal capacity is, the longer it takes for the device to saturate the coffee and therefore enrich it with healthy substances and flavor. The filter basket, which contains powdered coffee grains, is a crucial component. Filters are made of paper or nylon. Paper filters are disposable. They go to the waste basket after use. This seems a little inconvenient because you need to make a ‘strategic stock’ of them every time you go on a trip. On the other hand, there is no need to worry, because paper does not affect the taste. Nylon filters are versatile and non-disposable. You can just clean it and use it again. It will handle 60 to 70 cycles or more, if used more carefully. After a while, a deposit will build up on it and may slightly change the flavor. However, it will hardly be noticeable, except for experienced gourmets. You have to dispose of remaining coffee grounds, use bottled drinking water only, and replace filters every time you use it. This kind of portable electric coffee maker operates off 12V mains power supply, and it takes but a couple of minutes for it to cook a fine and highly flavored espresso topped with a thick layer of crema. They are made of non-slip plastic and look like a simple portable thermos. An espresso maker is 10 cm in diameter – same as a car glass holder. Many devices require E.S.E. pods. Some models feature a reservoir for ground beans. They are powered from the 12V cigar lighter socket via a cable. To cook an espresso, you should do a few simple tricks: pour in some water, connect the coffee maker to the socket, fix an espresso pod filled with coffee and press the button. Thanks to compact size and light weight, it fits in a glovebox and is a great trip item. They make very sweet and flavor espresso topped with its signature dense crema. You can cook a good espresso in any circumstances. Thanks to the shape, it often fits in car glass holders. You have to dispose of reservoirs and coffee grounds and use bottled water all the time. 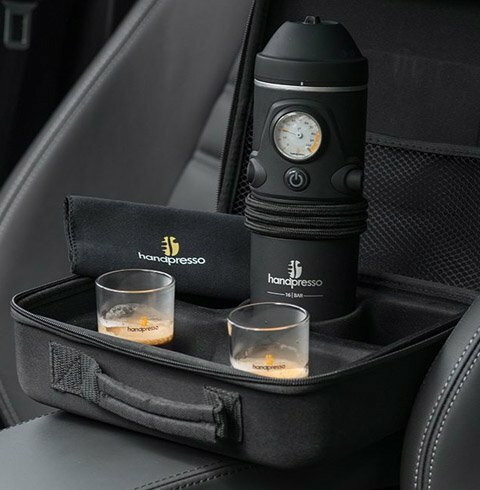 Handpresso Autos are much more expensive than drip car appliances. Most popular models can make only one cup at a time. A car espresso maker is a good thing for those who travel a lot. Car owners can choose a drip appliance, which can cook 1 or 2 cups, or an espresso maker. Truck- or bus owners can afford a coffee maker, which can cook up to 10 portions. Espresso makers are 5 to 6 times more expensive than drip appliances. A small portable device can produce hot drink, which is as good as that offered by half of coffee houses. Espresso makers can use different types of reservoirs and cook a cappuccino or latte as well. 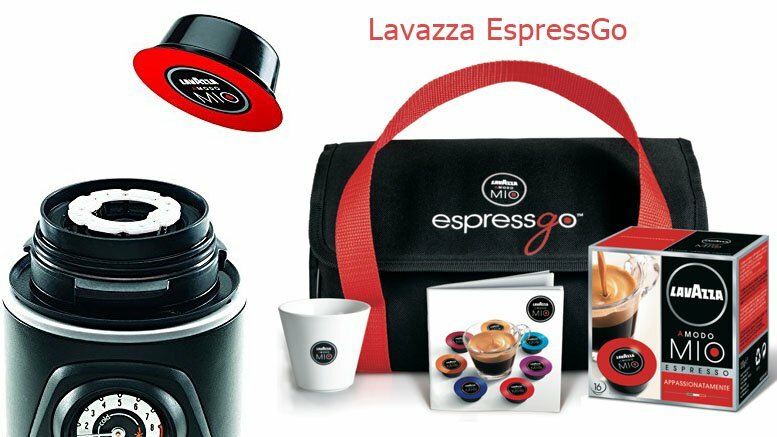 Lavazza’s EspressGo looks similar to a thermos: made of plastic and rubber, it also features a coffee making system. It supports Lavazza A Modo Mio pods, which are available in most supermarkets, and features a 16 bar pump. It is a purely automobile device, because the only way you can power it is via a 12 volt cigarette lighter in your vehicle. Other sources of electricity will not work. 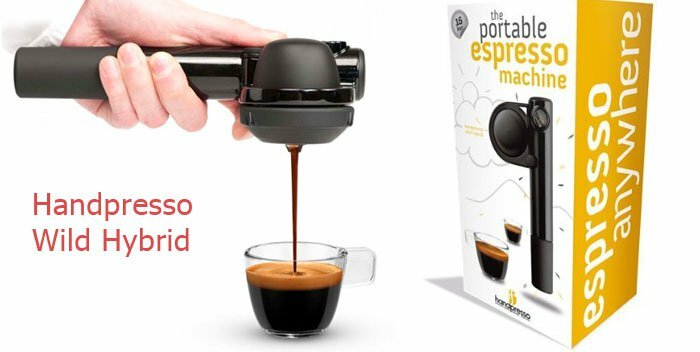 This tiny portable appliancecan handle one pod and therefore can make just one espresso. Pods are disposable. The maximum amount of water it can handle is about 50 ml, which is quite enough for a cup of coffee. There are three buttons on it: the power on/off button, pause button (you can press it to interrupt the process if necessary), and espresso release button. The latter works only when the machine is placed upside down. Although there is hardly a simpler coffee maker than this one, it should be operated during a stop only. Make sure there is enough room and the car is well parked. EspressoGo come with a 50 ml cup, a set of pods and a convenient case. When choosing pods, please, remember that an EspressGo is compatible with Lavazza pods only. Do not use Nescafe Dolce Gusto or MAP pods. Being the most renowned Italian coffee brand, Lavazza produces nine blends of coffee, which are best brewed in A Modo Mio systems. These devices are good for short drinks only, because they are too small for a ‘lungo’ or anything like that. They are suited for various types of vehicles, including ambulances and police cars. Finally, it is an idea option for campers. There is another way to brew a cup of espresso in a car or recreational vehicle (RV): buy a 12v electric kettle, which is powered by a cigarette lighter. Boil some water and brew hot drink in an non-electric portable device. French Press, AeroPress or Handpresso Pump non electric coffee makers will be great. The latter will provide you a cup of Italian espresso in less than a minute no matter where you are going. You can pump it in exactly the same way as you pump your bike. It won’t take a lot off effort to make 16 bars. Now all you need is some ground coffee (what is your favorite one? ), and some hot water in a kettle. 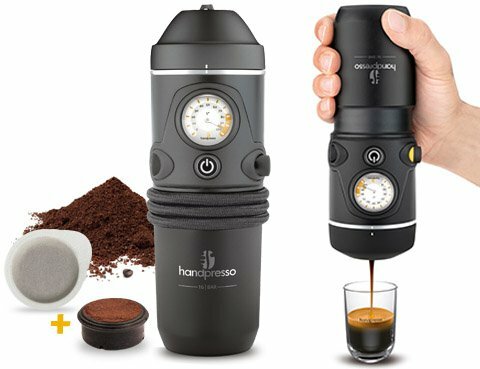 Compact and transportable, a Handpresso Pump does not need electricity.